This is the conclusion of M.C.A. 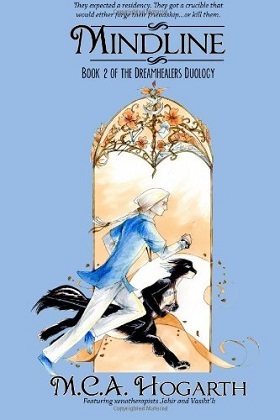 Hogarth’s The Dreamhealers Duology. I reviewed the first book, Mindtouch, here on September 1, 2013. In that novel Jahir Seni Galare, the colorless elflike Eldritch esper, has just entered interstellar Seersana University. His roommate is Vasiht’h, a short, skunk-furred centauroid winged Glaseah. They are both espers, but Jahir is an involuntary telepath to whom the impact of other minds is painful. In the course of Mindtouch, the two aliens develop a strong friendship, Jahir learns to control his talent – somewhat – and the two graduate. Jahir intends to use his telepathic talent to become the galaxy’s first xenotherapist, reading his patients’ minds to help heal them. The question is whether there is any danger of the esper medic’s becoming overwhelmed by his patient’s mind. Tampa, FL, Studio MCAH, January 2014, trade paperback $15.99 ([1 +] 341 [+ 7] pgs. ), Kindle $5.99. Jahir is doggedly determined to succeed if it kills him, which it looks like it will starting the moment he comes to Heliocentrus on Selnor. As a native of a light-gravity world on a heavy-gravity planet, Jahir is tired all the time, in danger of failing physically before he ever gets close to practicing his medical specialty, which has its own dangers. The Selnor natives admire his dedication, and go all out to help him at the same time that they consider him a little bit crazy, even suicidal. Vasiht’h worries about Jahir, to the point of leaving Seersana University and following him. Jahir’s assignment is to Heliocentrus’ Mercy Hospital. “I am here to find out,” he said. Mindline does an excellent job of advancing Jahir’s and Vasiht’h’s story while showing the reader what life among the Pelted and human species of the United Alliance in the 24th century is like. I find myself wanting to quote huge sections of Mindline verbatim. There are such wonders here. Circumstances keep delaying Vasiht’h on his journey to rejoin Jahir. […] and he knew with all the certainty of an esper that Jahir cared about him. No, the possibility that distressed him most was that his friend was not just busy, but overwhelmed. And that made him too agitated to enjoy what he would normally have found comforting: the bustle of people, the hum of their conversation, the evidence of the Alliance’s wealth and variety. Three days might not, but Jahir is slowly but steadily declining. It is not because of the involuntary mind-contact that he feared, but because of Selnor’s high gravity plus the rigors of the constant physical and emotional exhaustion at Mercy Hospital. By the time that Vasiht’h finally arrives to share the burden, Jahir is barely hanging on. Is Vasiht’h too late, or can he do enough to turn the situation around? Jahir doesn’t “want” to, either, but he feels that he “has” to. But is he taking on more than he can handle? Vasiht’h, who is also an esper and a university xenopsychology major, comes to aid him. Together the two help each other to develop the new discipline of xenotherapy. There are few novels that you HAVE to read, but Mindline is one, whether you like science fiction or medical drama. It is especially recommended to those who have any interest in Hogarth’s stories of the Pelted and their 24th century universe of the interstellar United Alliance.